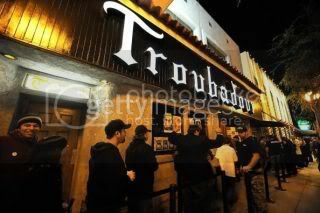 I came to LA to see the cure tonight at Acoustic Christmas, and found out yesterday about a secret concert they were doing at the Troubador. I was the 46th person out of 150 people to get a pass (the other half were rock star VIPs) and saw them play from the front row leaning on the stage, within touching distance in a 300 person venue. I was so close to Porl that I had to lean back when he really jammed out. What a truly amazing experience. Plus, all of the cure fans that I met yesterday are sooooo awesome. What a great community! oh man, what a truly amazing show of a lifetime. We were close in line then. We were 54th and 55th. I expected a mob scene out there. We didnt get there until after 11am and only 50 people were there! DJ - I dont really care for JLeto but I've met him a few times because my niece likes them and he is really sweet. My niece took a few pictures on her sidekick. I hated not having a camera but lots of people had them and used them and was not told to stop. thanks for this pic. I'm in the black tank top in front of Porl! ewww i hate kirsten dunst and jared leto. I love Kirsten, but who the hell is Jared Leto? frontman of 30 seconds to mars! ROFL! im really glad you guys got to experience this, its a million times better than KROQ. How big was this place? was a kind of a T&CC concert like in 1991 or the venue was larger? It is a very small club. Maybe 500 people? 200 fans/normal people and 300 or so guests/a-list types if they all showed up. Less than that, there were 400 MAX in that room. ... primary, the scream, one hundred years, it's over.... ! wow, what a finish! how did it sound, how has this was taken by the crowd ? I thought it sounded great. A fantastic finish for a show in support of the new album. It seemed like the crowd was into it, or at least the people in front of me certainly were. To be honest, I was kind of in a daze during that strech right there and didn't notice mych around me. You all will get a chance to hear it soon. I had my mics on, tucked under my shirt and hoodie. The R-09 was hidden in an uncomfortable spot. The battery box was in my pocket along with my cellphone. The guy asked what was in my pocket. I pulled out my phone and was allowed in. 8) If he had asked what the battery box was. Um, it's a charger I made for my phone I just hate stuffing everything in my crotch, so I try to avoid it when I think I can get away with it. Now, for the Carson Daly show I had the battery box and R-09 down there. Had to go through an airport metal detector AND then got the wand after. Thank you metal belt buckles! MySpace Secret Shows has some nice photos up now. Here's a bunch from Getty Images.